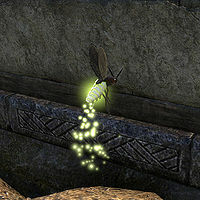 Torchbug Thorax is an alchemy reagent which was added in Update 10. It is occasionally found by catching Torchbugs (though usually you just get Insect Parts). Even prior to Update 10, Torchbug Thoraxes could be found as part of the Questionable Contract quest in Reaper's March. These quest-specific versions cannot be used in alchemy however. This chart lists only combinations in which two or more of Torchbug Thorax's effects are present. This page was last modified on 3 April 2019, at 01:24.